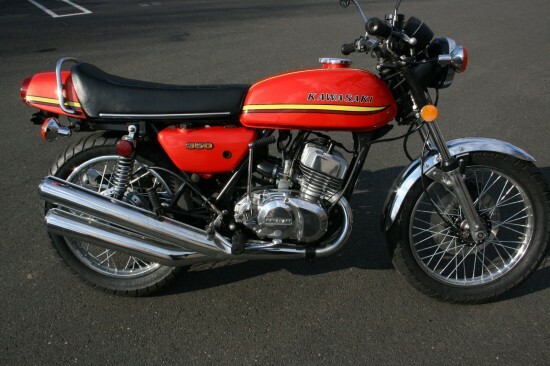 Kawasaki’s two-stroke triples were a milestone in Japanese motorcycling history. While the Honda’s CB750 offered sophistication and technology at a relative budget price, it wasn’t really doing anything you couldn’t get elsewhere, although you’d have to pay a lot more to get it… But Kawasaki’s line of two-stroke triples that started with their H1 500 in 1969 was exactly its own thing and created its own, purely Japanese vision of what a performance motorcycle should be. The bikes were designed for basically one thing and one thing only: brutal straight-line speed with a crackling, angry-buzz soundtrack that left a haze of blue smoke hanging in their wake. 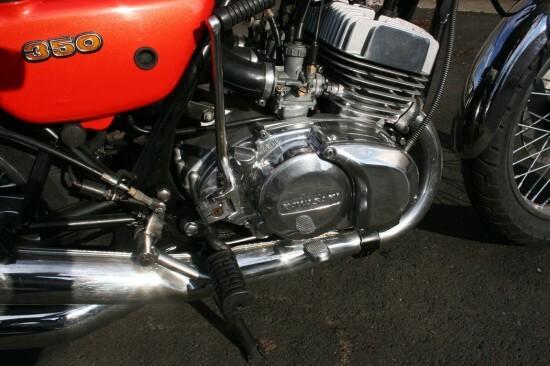 The 346cc engine featured a smooth 120° crank and put out a claimed 45hp at 8,000rpm in typical two-stroke, lightswitch-style and the narrower engine of the smaller bike improved cornering clearance. It was a good bit lighter than its bigger brethren at 330lbs dry, and that lighter weight led to a corresponding improvement in what was known at the time as “handling”. These little triples were actually pretty nimble, although the first year was definitely underbraked and the marginal front drum was replaced with a more powerful disc for 1972. 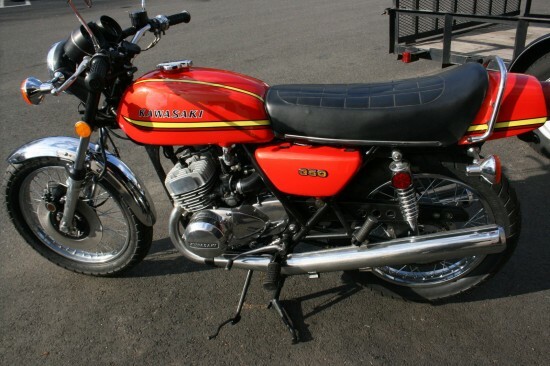 The 350 was eventually replaced by a 400cc version in 1974 that actually made less power but was more flexible. This is a fine example of a 73 S2. 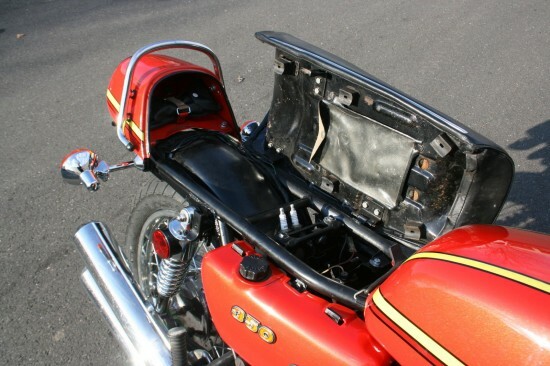 A fair amount of time and labor went into this bike to spruce it up. It runs very well and is very good condition. The tins were completely stripped to bare metal, reconditioned and painted to the stock original color. There is no decal: it’s all paint. 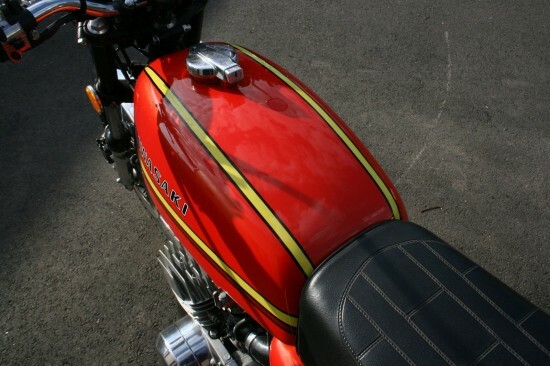 A professional vintage motorcycle auto body shop performed the work and it is showroom condition paint. 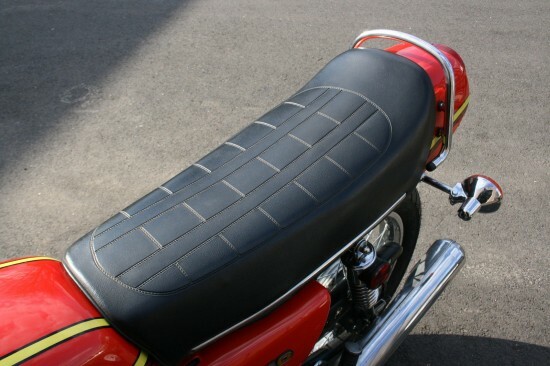 The seat is in pristine condition and is original. 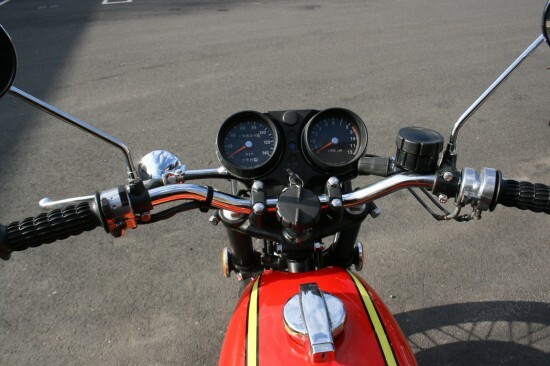 New bars, grips, mirrors, polished controls. The engine covers were removed triple polished and new gaskets were installed. Tube seals and dust boots were replaced. Both rims were in great shape and were cleaned, rear hub was triple polished, new spokes installed along with new tires and tubes. Cylinders were honed and new std bore pistons and rings installed. The caliper and master cylinder were serviced. Oil change, plugs, points and condensers, dialed in, timed and tuned. The carbs were serviced, synced and adjusted. It still has the clean original exhaust pipes. All hardware was cleaned, polished, and/or replaced. It is all stock in appearance. It starts on the first kick and rides nice and smooth. The S2 really isn’t at all what you might be expecting if you’re familiar with four-stroke engines of similar displacement. These things are very quick for their size and although tested top speed is shy of 100mph, they’ll get you off the line in a hurry and feel very much like their larger brethren, with the same dismal fuel economy: Kawasaki’s triples were the fastest machines in their respective classes, but you paid for that speed at the pump. With prices of the H1 and H2 bikes skyrocketing in recent years, this presents a cool opportunity to get one of Kawi’s famous triples in a much more manageable package for a much lower price.